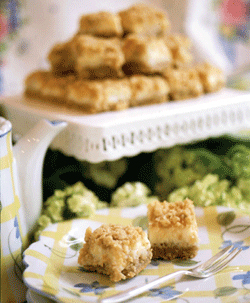 Not all lemon bars are created equal. We've tasted hundreds of them around the world and this has to be the creamiest of the lot. You'll find the recipe in the recipe section of "Tea & Etiquette" by Bruce Richardson and Dorothea Johnson, available in our book section. Combine condensed milk, lemon oil, and juice in a medium-sized mixing bowl. Stir with a wire whisk until smooth and thick. Set aside. In a large bowl, cream the butter and brown sugar. Add sifted ingredients, then oats. Mixture will be crumbly. Pat 2 cups of crumbs into bottom of a greased 9x13-inch pan. Spread condensed milk mixture atop crumb layer. Sprinkle remaining crumb mixture over layer, smoothing gently. Bake for 30-35 minutes, or until bars are brown around the edges. Remove from oven and cool completely. Cut into small squares and refrigerate. Bring to room temperature before serving. Makes 30 bars.